My chapbook, Wearing Heels in the Rust Belt, winner of Main Street Rag’s 2011 Chapbook Contest, is the first selection. Part working-class narrative, part coming of age story, Wearing Heels features poems that were first published in 5 AM, Cave Wall, Copper Nickel, Harpur Palate, and River Styx. This chapbook also features my poem, “The Summer I Stopped Catching Bees” which was originally published in Glass: A Journal of Poetry and then was selected for Sundress Publications’ Best of the Net 2011 issue. (You can also read the poem here.) 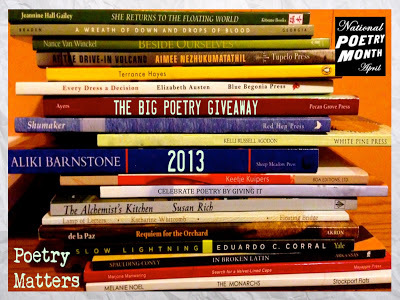 If you are a fan of narrative poetry, this chapbook collection may be something that you will enjoy! Many of my regular readers already have a copy of Wearing Heels (again, as always, thanks for the support!). Still, you may want to throw your name into the hat, so to speak, for Rust or Go Missing by Lily Brown. Rust or Go Missing is a collection of sparse images. This is not to say that the poems inside are sparse — indeed, Lily Brown’s poetry relies on the line, sculpting poems through white space and concrete images. This collection, published by the Cleveland State University Poetry Center, features poems that were originally published in Coconut, Denver Quarterly, Fence, Octopus, and Pleiades. So, go ahead! Drop me a note (with contact information — preferably an email) for a chance to win. I will pick the winners during the first week of May and besides contacting the winners, I will make a formal announcement on my blog. 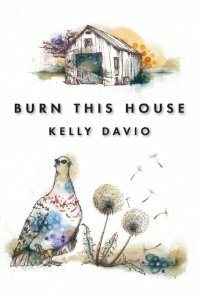 Burn This House, Kelly Davio’s debut poetry book, is a collection of close and quiet observations inspired from her religious upbringing. In this work, a reader may see secular life or heavenly miracles, hope or certain doom, the end of what we know or the sweet beginnings of a different world. Davio, herself, has said that the book in part was inspired by her childhood. According to a recent blogpost, Davio explains, “I grew up in a curious way. My family was intensely religious, but their religious views were always changing, and we never stayed in any one church or branch of faith for all that long; our beliefs in my formative childhood years were always in flux, and in my young mind, I was quite confused and fearful.” Indeed, Biblical references abound, sometimes with religious figures such as ministers and nuns meandering through poems, sometimes in Biblical stories intertwined with personal narratives. For instance, in the poem, “Sympathy,” the narrator tells the story of Leah and Rachel in a juxtaposition exploring her own relationship with a sister. I need to make clear that Davio’s collection is not preachy. A reader will not find poetic rants full of religious self-assurance. On the other hand, there’s no real evidence that the narrators found in this book find spiritual enlightenment. (Even in the section titled “Revelation” — the revelations from the narrators are quiet and often, a bit unsure) Indeed, if anything, these poems are questions — questions about both our physical surroundings and the spiritual world we may never really understand. Davio’s work was new to me and indeed this collection was recommended to me by poet Jeannine Hall Gailey (who, by the way, always has some great recommendations for my poetry reading list!) In a year, where I have inundated with new poetry collections, Burn This House, will certainly be one of my top picks for 2013! For more information about Burn This House, check out Davio’s website. Last week, my students were trying to convince me that yes indeed, they saw robins. Having seen nothing but our usual winter birds (including the obnoxious Blue Jays that hang out in the pine trees in our back yard), I didn’t believe them. 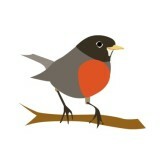 But I saw a robin yesterday, while I was trying to maneuver through what I hope will be our last winter storm. He did not look happy. Still, I have to believe that Spring is in the air. Even if we are under another Lake Effect Snow warning. Even if I am wet and cold and the only sign of spring that I really see is an annoyed robin, who looks incredibly displaced in this world of slushy white. Split this Rock is looking for poems from poets who write in the “socially engaged vein.” In 2009, Split this Rock began publishing poems from poets who participated in the festival. However, they recently opened up their call to anyone who writes about today’s social issues. Check out the guidelines here. And while you are at Split this Rock, check out the recently posted poems by Jericho Brown and Remica Bingham. The theme for the next issue of the Glass Seed Annual is superstition and reason. According to the journal’s website, Editor Mary Alexandra Agner, is looking for “poems which emphasize the music of language through alliteration, anaphora, refrain, repetition, and other formal metrical devices.” The journal is also looking for pantoums on any subject. Submissions will be accepted until September 30, 2013. (And guess what? This is a paying market!) Please check the guidelines for further details and sample poems. While everyone else in the world (okay — not everyone….) is at AWP, I’ve been trying to catch up on my writing, and have been somewhat successful. I managed to send out a submission, the first submission I have completed since mid January. I “finished” three more poems. And, I started completing research on my presentation for the working-class studies conference. I also finally got my taxes done — I know that doesn’t really have anything to do with writing except it makes me realize how broke I am! This weekend, we are going to get a dose of spring weather with sun and warm temperatures. It’s really amazing how much better one feels when there is a cloudless blue sky. We are, however, also springing ahead (Did you forget? I almost did. Thank goodness there are reminders everywhere!) The time change always knocks me around a bit, and it often really messes up my students’ schedules. We will see how the week goes! Okay, I can’t honestly say that March blew in like a lion — more like an irritable lion cub. We haven’t had a lot of winter weather, but the sky has been completely gray for five days straight with no sun whatsoever. I’m so pale, that I swear I could audition for a part in a teenage vampire movie. Except that I don’t look like a teenager. I really, really need some sun. I spent this past weekend glued to my desk, trying to get caught up with my work for school. It wasn’t a fun weekend, but now I feel like I can face March and the weeks before spring break. I won’t be at AWP this year, although I’m certainly envious of those of you who will be…safe travels to all and make sure you have a great time! A lot of new books are coming out in time for the big event, and I have already ordered my copies – many should be on my doorstep soon. I am, however, going to this June’s Working Class Studies Conference that will be held in Madison, Wisconsin. One proposal has been accepted, and another is pending. I have attended two of these conferences before, and I’m really looking forward to this year’s program.